Can International Culture be Developed by Friendship? Of all the relationships only friendship transcends all barriers obstructing freedom of an individual. 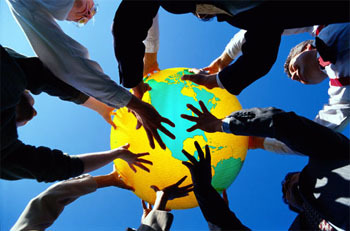 The development of international culture is going on based on friendship in the modern world. Certainly friendship develops human culture that has been advocating the promotion of best thoughts, words and deeds among individuals leading to the creation or inventions of good, beautiful and beneficial things for humankind. These worthy individuals are like the friend Jeremy Taylor expressed in his essay, The Choice of Friends who will be helpful in private and useful in the public. Naturally worthy friends, who are as a team able to achieve miracles in many fields, are capable of making the world of differences, disparities, diversities into One Human World. Friendship is next to love only in human nature and whose value is esteemed by anyone. A friend is a natural brother or sister though not by blood relationship and may become a lover too if possible. Friendship is a natural relationship that may become a blood relationship too if circumstance permits. Committed to be friends, unity becomes strong whether they work for a good cause or a bad cause. Ideally an individual, who is physically, intellectually and materially strong can become a friend to a person and who happens to be helpful and very useful in deeds at the needed times, becomes a real friend. Because of good friendships, benefits to human society or the world are many and hence welcomed by all. Not only the individuals but also for the nations the views on friendship and its value and benefits hold good. United Nations Organization is a friendly international forum created by the friendly nations of the world mainly to stop wars and maintain peace, provide peace, security, freedom and rights for all and promote economic, social and cultural developments in various nations of the world after World War II. Even after the creation of UNO, cold war between the communist Russia and the capitalist America went on unabatedly for more than four decades. In that time the two economically, militarily and technologically advanced Super Powers signed defense treaty alliances with their friendly nations around the world and divided the world into two, controlled by those two power blocs. Other friendly nations consolidated themselves into Non-Aligned nations supporting either of the two Super Powers based on justice under the aegis of the UNO during the times of international crises over important matters concerning all as a whole. After the collapse of the Soviet Union due to the failure of socialistic dictatorship as a result of lack of morality and the success of capitalistic democracy in the countries of the other bloc as a result of sincerity of approach, the whole world breathed a big sigh of relief anticipating peace and developments everywhere. In the changed world scenario, the sudden blow of terrorism on humanity paved the way for new alignment of nations on the basis of friendship for the unanimous fight against terrorism and for cooperation and coordination towards developments in various fields giving the hope to humanity of its cherished dream of One Human World a new direction at last by their new kind of International Culture. Benefits and bad effects were experienced by the friendly countries of the Super Powers, whose policies blew hot and cold in their developments for good or bad. Japan, South Korea, Singapore, France and West Germany were benefited and progressed under the umbrella of America. North Vietnam, North Korea and East European countries suffered bad effects due to imposition of communism or socialism under the dictatorship rules supported by Russia and China. Japan became an economic giant in the East. France and other western countries recovered from World War II wreckages, and progressed and prospered assisted and helped by the USA. Vietnam and East European countries remained poor suppressed by totalitarian regimes whose leaders acted as masters under the guise of comrades directed by their big brother, USSR. Only after the collapse of the Soviet Union because of its wrong policies, the erstwhile States of USSR and East European Satellite States got relief from the hug of the bear and became independent nations to look after their matters by themselves. So, it is better to remain alone than in the company of bad friends. The knowledge of history is the best friend, philosopher and guide much more and better than the company of imposing friends with full of promises only. Friendship is the main plank upon which International Culture develops and thrives in the world. Based on the position, needs and interests friendship starts between nations leading to signing of treaties for defense, cooperation, coordination and coexistence towards the over all developments benefiting all as time goes on. In this way in the course of time friendship of this nature has developed International Culture, a best way of the world for the benefit, well being, unity and oneness of the world. Perfect example in this regard is the formation of the European Union that has developed as a result of International Culture paving the way for its extension from the West to the East, which is turning into reality leading slowly to the formation of the World Union or One Human World in the future though a most cherished dream or a Utopia most desired by the humanistic intellectuals of the world since a long time. In a matter of fact manner only international business has been the link among nations of the world promoted by mutual profit motivation which is the beginning of the international culture based on friendship. After the political ideology of communism and its corollary, socialism expected to boost the socio-economic developments of the nations met with total failure, the door of capitalistic democracy has opened wide for many nations to embark their efforts on many fields in the new direction with hope and confidence seeing the success story in the developed democratic nations of the world. So, democratization and liberalization of economy have begun everywhere today. Liberalization leading to globalization of economy has integrated many nations with the world (free) trade. As a result the necessity of opening road and rail links between nations has broken the barriers among them across the globe between South and North from North Korea to Siberia in Russia via China and Mongolia and between East and West from Singapore to Istanbul via Myanmar, India and Pakistan after the conference of the South East Asian Countries on multilateralism in the fight against terrorism led by USA besides development of trade and tourism among them. These are indeed encouraging message of International Culture on the basis of friendship. Even in the past historically famous silk route and spice route between Europe and China, and Europe and India were laid by Marco Polo, Vasco Da Gama, etc. Also, Pallava Kings of South India had established cultural ties with South East Asian countries like Vietnam, Indonesia, etc. Further through pilgrims like Fahien and Hieun Tsang from China, Buddhism had spread to China, Japan and so on. So, through trade, culture and other ways friendship was well established between East and West in the past and by sea routes due to friendly relations transport of goods, travel of people and exchange of ideas on religion, philosophy, literature, astronomy, astrology, medicine, mathematics, geography and culture were wonderfully going on between East and West. Later European powers under the guise of promoting foreign trade colonized many nations in the world. A few decades before the end of 20th century those colonial powers gave independence to many nations. However, they formed friendly ties with those nations as Common Wealth countries to cooperate and coordinate with them for developmental activities in various fields. Likewise exchange of goods, ideas and men for the spread of religions and cultures have changed the world to the present status. World wars had disrupted peace and friendly ties of many nations and divided the world into blocs. After the cold war the world trend has turned in favor of cooperation, coordination and peaceful coexistence paving the way for developments in many fields on the basis of friendship in pursuance of the policy of economic globalization. Now as terrorism is doing havocs to many nations in the world, all peace loving, civilized nations have joined together to fight against terrorism and put an end to it once and for all so that peace, security and progress can be assured for all. Naturally the principles such as cooperation, coordination, coexistence, non-aggression and non-interference in the internal affairs of other nations of the Foreign Policy of many nations on the basis of friendship has become the International Culture for the promotion of peace, stability, developments and progress in the world. Wars, war preparedness and defense expenses have become an unnecessary burden on the economic development of many nations. Though globalization of economy is helping much the entrepreneurs, large scale manufacturers and monopolists on the one hand but not helping small scale entrepreneurs, small business men and professionals on the other hand, it has opened the door of the wide world market to try one's efforts in the opportunities available in many ways to enrich oneself and the world; and so, it seems the imbalance in this activity can be rectified in the due course of time by the unanimous efforts of both the rich and poor nations initiated by the World Trade Organization (WTO) and the World Bank. In this changed circumstance unification of nations like East, West Germany, North, South Korea, etc. is only a natural process of the International Culture that has started recently on the basis of friendship for the benefit of both sides everywhere. The reunification of Germany in 1990 gave the impetus for the formation of European Union at the fag end of the 20th century. To overcome foreign exchange problems, security problems at the borders, smuggling and trafficking activities, 12 West European countries formed the European Union with common laws for them to follow using one common language, English for communication purpose, single currency, Euro for exchange purpose and joint security force to defend them. Accepting the fact that nationalism is only a part of internationalism this union compromised broad-mindedly their sovereignties and individual identities. This is a perfect example of International Culture that unites nations for peace, progress and prosperity. So, this International Culture has become a model for other countries too to follow sooner or later. Russia dreams about the Russian Federation with its former satellite States of the Soviet Union. Kazakhstan thinks about the Asian union. East European countries too are willing to join as part of One European Union. Thailand feels about South Asian Union. African countries too have formed African Union in 2002 on the model of European Union. So, it won't be difficult to form an American Union also by joining North and South American countries under one roof. Hence these dreams, thoughts, feelings, desires and ideas are really a healthy kind of human sense for the formation of World Union or One Human World by International Culture under the principles of the international body, UNO in a thoroughly revamped and reconditioned fashion in the near future.